Ryerson student Noah Parker co-founded a made-to-measure clothing shop for men and women as a class project. To the usual back-to-school checklist, some postsecondary business students add something extra: running a startup while going to class. The juggling act is not for everyone, students warn, but they say the experience teaches time-management skills and frees them to embrace the entrepreneur's classic mantra of "go for it." The phenomenon is on the rise, say professors, with a growing number of student businesses getting started in and outside the classroom. "It's absolutely not a one-off," says Richard Lachman, director of zone learning at Ryerson University, which offers 10 on-campus business incubators for about 800 young entrepreneurs. Of them, 40 per cent are students, 20 per cent are recent alumni and the rest come from outside the university. "We are actively encouraging this [startup activity] and we are seeing quite a lot of interest from current students," he says. For Blawal Aleem, a bachelor of commerce student at Ryerson's Ted Rogers School of Management, the idea for his just-in-time tutoring app took shape two years ago when he was cramming late at night for an exam. "Most startups are born out of an inconvenience," says Mr. Aleem, who specialized in business technology management for his degree and graduates next month. "I needed someone at an odd hour. And I needed them right then and there." After doing research on the tutoring market, he developed an app that connects students to a study expert in their area. Mr. Aleem describes his Tutourist app as an "Uber for tutors" that, like the ride service, allows students to search for subject-specialist tutors, learn about their prices and ratings and schedule an in-person meeting right away or a set later date. "There are online [tutoring] services via the computer but nothing to connect you in real time in your area," says Mr. Aleem, who recently received project seed funding. With those funds, he pays himself a salary and, with backing from student associations, plans to sign subscribers when the app goes live in several weeks, first at Ryerson, University of Toronto and York University. Mr. Aleem, who organized his own co-op placements while in school, says that balancing class and startup activities "is not an easy task at all." To those doing both, he says "never prioritize your startup when you are in your studies." From experience, he learned to put his venture on a back-burner when studying for an exam and organized business meetings in downtown Toronto to complement his class schedule. "Time management is a priceless skill," he says. Another Ryerson business student worked on his startup, nurtured in the university's fashion zone learning incubator, as a major class assignment during third and fourth year. 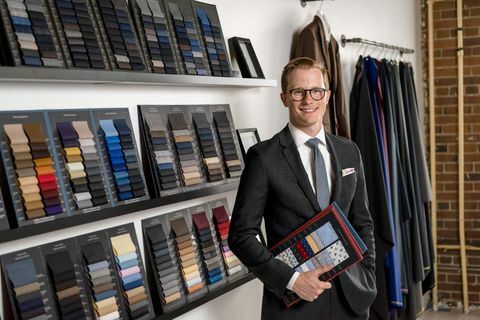 Noah Parker, one-third of a triplet of brothers, co-founded Four Fifty Five Apparel Co., a made-to-measure clothing shop for men and women, with sibling Jake, a graduate of George Brown College in Toronto. Oliver, the other member of the trio, was an early customer. "We were expected to start a business," Noah, creative director of the clothing retailer, says of his class project. "We were encouraged to start our own venture, find some financing," he says. "We were required to find external financing and that was one of the bigger challenges." The idea for a bespoke clothing company came on a 2014 visit to Italy when Noah and Jake stayed with family friends in the fashion business. Intrigued by what he saw, Noah soon received mentoring from industry experts and school professors. He and his brother began selling accessories and then added suits and shirts using fabric imported from Hong Kong and elsewhere. After selling online, the company opened a boutique last spring with Noah in charge of design. "It started off as a school project and now is a labour of love," says Noah, currently completing his final courses at Ryerson at night and on weekends and working with his brother (and two others from Ryerson) to expand the company's physical and online presence. Noah, with ambitions to enter politics, recently landed a full-time position at Queen's Park with the office of the Ontario Minister of Finance. Aside from time management, he says, "the biggest thing I learned at Four Fifty Five was the need to just run with it." He adds: Pick a date and go. "We did not sit on our hands for months to dot every I and cross every T. The second we had our minimal viable product, we started selling it." Like Mr. Aleem at Ryerson, a fourth-year student at Wilfrid Laurier University's Lazaridis School of Business built his business from a problem he faced at school. Andrew Stubbs, a business administration major, says he struggled academically in his first year and watched as friends, to their detriment, turned to stimulant prescription drugs (some bought or borrowed from roommates) to study all night. With $20,000 in seed funding, support from family contacts in the pharmacy industry and advice from his professors, Mr. Stubbs developed a natural health supplement, trademarked Klarity, as a calming study aid that received Health Canada approval two years ago. His company, StudentXel, works with a Toronto manufacturer and distributes the supplement in several university convenience stores and health food outlets in Ontario, and it also offers lifestyle advice on relieving stress and anxiety without resorting to addictive drugs. Managing school and work obligations, says Mr. Stubbs, "is all about balance and being self-aware." He carves out blocks of time during his day for school assignments, company development and meditation. For students itching to turn an idea into a business, Mr. Stubbs likens the decision to jumping into a lake for a swim. Some people hesitate, fearing the water will be cold, while others boldly jump in. Potential entrepreneurs, like bold swimmers, he says "need to get in."